I suppose we have it pretty good in the Bay Area when it comes to Airsoft. Compared to many other places in the United States (where the sport is just not as popular - everyone plays Paintball instead), there are a lot more choices and options here. Unfortunately, it's still not easy to find a public field to play on and to get in a game on a private field you have to know people and pack your own gear - not an easy way to introduce new people to the sport. Roundhouse Productions at Ford Ord (Marina, CA) - Based on the old army base near Monterey, California, this was one of the best places to play large group public games (sometimes over 200 participants). There were going to close after September 2007 and look for a new location, but they've managed to keep having games at Fort Ord. Looks like they're managing to keep alive - which is excellent news. No rentals. Sequoia Airsoft [Combat Enterprises] (somewhere 45 min. south of San Jose, California) - Runs games every 2nd and 4th Saturday of each month. 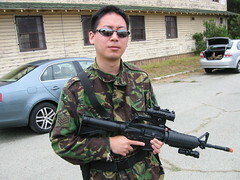 It is (apparently) the last public airsoft field in the immediate Bay Area. They do not take walk-ons - you must register at least a day in advance to be provided instructions to the field and be allowed on. They ask all their participants to wear appropriate clothing (BDU's - Battle Dress Uniform/Camouflage) but I've read accounts of people bringing guests in black shirts and jeans. Face mask rentals only. Modesto Airsoft [Combat Enterprises] (Modesto, California) - Games every 2nd Sunday of the month. No walk-ons - all participants must pre-register. Face mask rentals are available. CQBCITY (Stockton, California) - The airsoft facility with the most annoying website. It's supposed to be the world's largest indoor airsoft arena. Being that it's all the way out there in Stockton, I've not been. Mike Force Airsoft (Moss Landing, California) - This airsoft club runs games in a field halfway between Santa Cruz and Monterey. Public games are held every 2nd Sunday of each month. They do provide weapons rentals, but BDU's are required. Sacramento Airsoft (throughout the Sacramento area) - This is more of a loose network of people who play airsoft in the Sacramento area. It doesn't look like there is a central facility or group of people that make everything happen, but individuals and teams will post their game dates, locations, and rules for others to participate. Eagle Force Airsoft (San Jose, CA) - Games every Saturday starting at 6am. No BDU's (battle dress uniform - camouflage) necessary. Must be 16 or over. Orchid Bay (South San Jose, CA) - Closed multiple times due to vandalism and fires. Closed for good now because of a huge after hours fire that destroyed just about everything the proprietor had to his name. When they were open, offered weapons rentals and face masks and was a good place to introduce new people to the sport. FortOrd [Combat Enterprises] (Marina, CA) - Closed. Operation Paintball (Hayward, CA) - I believe they offered weapon rentals when they were open. Rumor is that the facility was bought by a Laser Tag company and shutdown to be eventually reopened with Laser Tag. (Part of me is sad that a paintball company moving towards airsoft [right direction!] was bought and pulled back to Laser Tag [wrong direction!]) In any case, this was my least favorite environment since it was a pretty cramped indoor arena (arena is the right word - it does NOT feel like CQB) where everyone just rushed around and shot everything. Tactics and strategy had no real place in this environment. Shadow Tactical (Santa Rosa, California) - A 9,000 sq. ft. indoor cubicle based airsoft CQB (close quarters battle) simulation. Pistol and face mask rentals available. I spent the weekend at CQB Challenge, a training event and competition focused on military and law enforcement simulation (with special emphasis on close quarters battle). There were twelve registered teams at the event and six people who did not have a team (including myself) who were assigned together to form a team. The other twelve teams had been practicing together for at least a month and our team had one main goal: to hold our own against them even though we would only have one day to train together. Using airsoft (air propelled weapons that shoot 6mm plastic BB's) rifles and pistols, the 80 or so participants would be trained by a large staff of former and current military and law enforcement in working together as a military team. There is no camaraderie like the that of a team who has trained together as a single unit, each relying on each other wholly.